His creation is driven from the power of natural force. The moment in which creation comes from destruction. In full commitment and trust, the artist devotes himself to the cycle of death and rebirth to which life in the material world is bound. As he strikes the copper with his axe, the work emerges. The work reveals the depth of simplicity — the raw cuts within the copper plane; a declaration that from this space of openness, the end becomes the beginning. In this perfect unfolding, each strike is a birth. The inspiration came from the artist's commitment to making the work come “alive”, taking the relationship with the work beyond the surface. Through a process that is both physical and emotional, the plane transcends into a living object. Using the entirety of the 1600 sq. 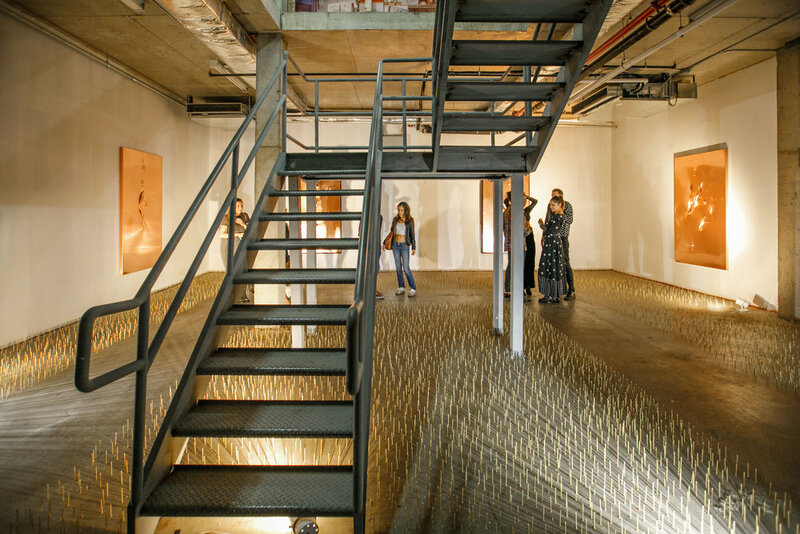 ft exhibition space a massive installation creates a relationship between the work on copper and the viewer. Franz Klainsek spends several days balancing one gold nail after another on their base. He does this deprived of sleep, food and with minimal liquids. “Presence” is an immersive performance art piece that evolves into a multidimensional installation. The concept of the piece is a full commitment to the present moment. “Present. Nail to nail; breath to breath; choice to choice,” — the piece is fueled by moment to moment intention. The space where every breath is channeled into the creation of the piece. “We are born with fresh eyes to only have them tainted. All we have learned begins to dissolve as we get closer to the essence of our being. The past does not exist, neither does the future. Every moment is a chance to start anew. A new beginning... Rebirth. The work is a raw and direct interpretation of Klainsek’s studies of the subconscious mind, life experiences to date, and the strong desire to journey on into further understanding Truth. “Walk through this structure aware of your surroundings, or face knocking it down. Hold your apologies if you do. My intention is to interact with you through this experience. So, take a deep breath, bring yourself back to the moment, and now place them with strong intention. We march forward: more present than when we first took a step into this journey. I created this piece in name of yours and mine awareness. I wanted you to be, to be present, to be aware, to be conscious: I wanted you to pull up to the copper with your senses heightened and ultra committed to the moment. This was one reason for creating this installation. Unconscious behavior was not to be brought on my door step. If you go to an exhibition try to stop, feel, think, explore; just choose growth in some shape or form.